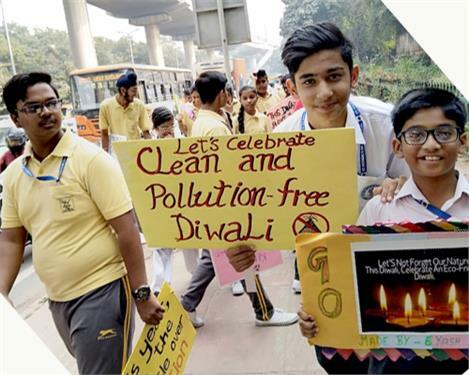 Showcasing the initiative taken by Don Bosco Delhi, getting twelve Catholic Schools in the Country’s capital pledge for a cracker-less and pollution free Diwali this year, the CBCI Office for Education and Culture, Catholic Bishops’ Conference of India, reaches out to its thousands of schools across the country to opt for a similar decision in celebrating Diwali. Fr. Joseph Manipadam, Secretary CBCI Office for Education and Culture says,” More than 20,000 students from the leading 12 catholic schools in the national capital have courageously taken the initiative that they prefer to enjoy less this year by way of bursting crackers in order to save the children and the elderly from lung disorders and gift them a longer span of life”. It is a small sacrifice to show love and compassion to the people of our own country. The joy and satisfaction in sacrificing a short lived and temporary enjoyment is far more rewarding when it is for the welfare and good health of the vulnerable section of our society. We recommend that all the schools across the country follow this wonderful example set by the children of these schools. They indeed make us feel proud. This is true love for the country, this is true nationalism and patriotism at its best, as Mother Teresa said, “We must love until it hurts”. We congratulate these children for lighting a candle instead of cursing the darkness. The little sacrifice they make can inspire thousands of others in a big way. In fact when everyone seems to be throwing up their arms in despair, not knowing what to do as we listen to the endless debates in the media giving continuous coverage to the hopeless situation across north India, these children give us hope and tell the rich, the affluent and the politicians that all is not lost and all of us can and must contribute our own share of good will and compassion and become a little more selfless and caring to improve things so that we can all save ourselves from choking to death or gasping for breath. Don Bosco Aleknanda with 2288 students; St. Xavier’s School, Raj Nivas Marg with 3856 students; Holy Child School, Tagore garden with 2424 students; Convent of Jesus and Mary School with 2408 students; Notre Dame School Badarpur with 2093 students; Presentation School, Old Delhi with 1800 students; Loreto Convent School with 1470 students; St. Michael’s School Pusa Road with 1200 students; Notre Dame School Najafgarh with 1015 students; St. Charles School, Najafgarh with 958 students; Mater Dei School, Tilak Nagar with 600 students and Holy Cross School Najafgarh with more than 500 students have become the trend setters. You students and teachers you are an example to all of us and you make us feel proud and give us the hope for a better tomorrow. Have a wonderful Diwali!